We recently had a data blitz in the lab as part of our regular bi-weekly lab meetings. The premise was, in 1 slide, summarize the current state of your research project and findings. This was a great means to get everyone updated on the projects, and in this case it served as mutual introduction for Sadia Shakil, a visiting scientist from Pakistan, who is joining us for one-year on Schlumberger Foundation Faculty for the Future Fellowship. And without further ado, here is a review of some of the cool work being carried out by our lab members. Main focus during my PhD was on understanding and modeling the dynamics of functional connectivity (FC) networks using resting state functional MRI (fMRI) scans. 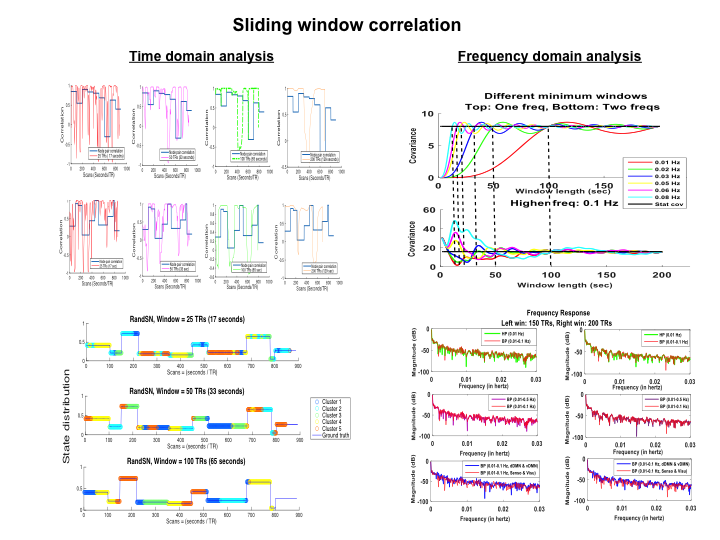 We evaluated the performance of most commonly used dynamic FC analysis method of sliding window correlation (SWC) and discovered its shortcomings. We also proposed a new algorithm to detect the change points of FC networks. In the future, I plan to work with TheVirtualBrain to explore the structure in task-based and resting-state functional connectivity networks. I plan to use multimodal data like EEG and MEG along with functional MRI for this purpose. The focus of my work has been on examining how information integration in neural networks is related to cognition and our subjective, conscious appreciation of our environments. One project has revolved around music perception, due to its multidimensional and information rich nature and the obvious high individuality of musical experiences. First, I investigated the use of brain signal complexity (measured as sample entropy across multiple temporal scales, or multiscale entropy) as a marker of neural information processing in two musical training studies. We found that brain signal complexity is higher in adult musicians, and this effect was most pronounced on a task that showed the largest behavioural difference between musicians and nonmusicians (A). To follow-up, we investigated the experience-dependent nature of this effect (B). After a month of music training was given to pre-school aged children, their brain complexity was higher in regions typically involved in music perception (e.g. Right primary auditory and superior temporal cortex) as well as parts of associative cortex (e.g. Precuneus and superior parietal cortex), which are purported hub regions. 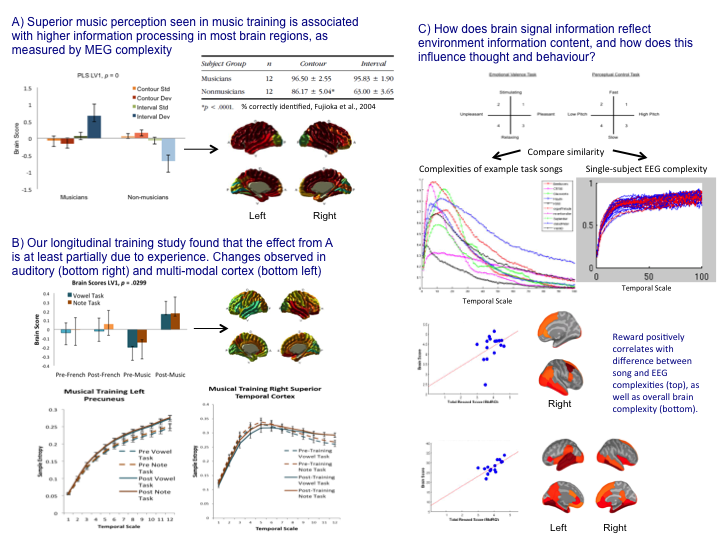 These changes in brain function were observed on music and linguistic perception tasks, leading us to propose that musical training increases diversity of brain network integration to support domain-specific music skill acquisition and music-to-language transfer effects. My main focus is characterizing brain network dynamics in children and adolescents with autism spectrum disorder (ASD). For my first PhD project, I used unsupervised machine learning to define subtypes of ASD based on static and dynamic functional connectivity (FC). I found two ASD subtypes characterized by differences in FC within and between resting state networks, as well as differences in relationships between FC and measures of ASD severity. My second project involves using TheVirtualBrain to characterize mesoscopic-level brain network dynamics in ASD. In addition, I am currently working an a project that involves a systematic comparison of different fMRI preprocessing strategies to determine how these choices influence the resulting FC, as well as group differences in FC observed between participants with and without ASD. I started my PhD at the lab, September 2017 after previous work as a music therapist in geriatric and adult mental health. My research background is in music psychology, and my current focus is coursework, particularly statistical modelling and computational models of complex behaviours. I'm currently working on extracting features from musical stimuli and investigating how they may be represented in EEG data collected during music listening. I'm also preparing a review on the neural correlates of musical improvisation. My interests include studying changes in brain networks involved in music processing and production during healthy aging and with the onset of neurodegeneration, and I'll be examining this interesting topic during my PhD. In a new project that I am doing across labs, I investigate local BOLD signal variability in older adults at-risk for developing mild cognitive impairment. We show BOLD variability, measured during resting state, is related to neuropsychological performance, though the direction of the effect is dependent on group and cognitive domain. 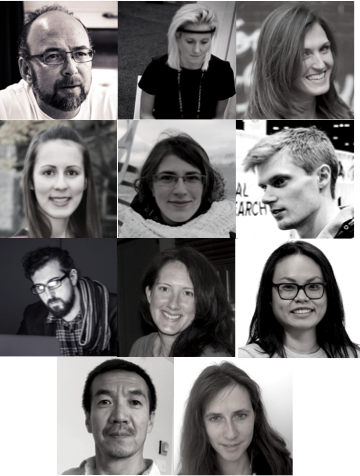 Our next steps will explore how local variability supports functional connectivity, and again, how this relates to behaviour. Like most people in the group i have my finger in several pies at any given time. Probably the largest and hottest pie at the moment is work I am doing in collaboration with Jeremie Lefebvre at the Krembil Institute for Neuroscience on neural oscillations and brain stimulation. Large-scale oscillatory activity such as that observed in human M/EEG is believed to arise from a combination of cortical (e.g. Intracolumnar excitatory-inhibitory coupling) and thalamocortical mechanisms. There's been a lot of progress over the years on characterizing these two mechanisms separately, but relatively little that attempts to unify them in a single framework. So one of the things we've been working on is developing Virtual Brain models with more detailed and more prominent representations of the strong recurrent thalamocortical circuitry, by writing the thalamocortical loops directly into the equations describing the dynamics of cortical areas. The data in the figure is from a VirtualBrain model where each network node represents an individual cortico-thalamo-cortical motif with four components: a classic Wilson-Cowan ensemble of excitatory and inhibitory cortical neuronal populations, coupled to a pair of excitatory specific relay and inhibitory reticular thalamic nucleus populations. With this simple schematic we can reproduce a wide range of empirical observations, including M/EEG alpha rhythms and their suppression during cognitive tasks; functional connectivity; and effects of periodic brain stimulation. One of our main questions now is trying to understand how the topology of cortical connectivity influences brain rhythms and responses to rhythmic stimulation. Where next with this work? Well, one modest aim i have with this work is to move towards a more 'closed-loop' theory-hypothesis-experiment cycle, where we use The VIrtual Brain simulations to generate predicted M/EEG responses to TMS stimulation, use the models to generate novel predictions, and then acquire data to test those predictions in more-or-less real time. That would be great, right? My main focus is understanding the link between individual structural and functional connectivity (SC, FC) and cognition. 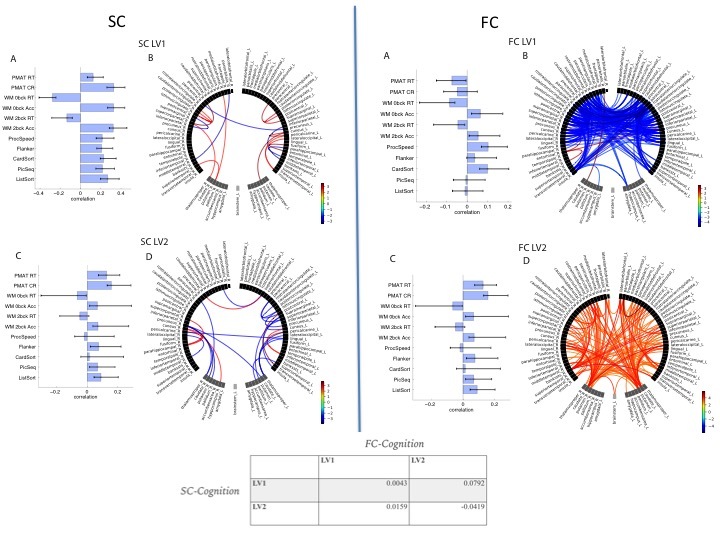 Our findings show that SC and FC is associated with individual differences in cognition. Multiple features of connectivity-cognition patterns are needed to describe the full range of associations, rather than a single global pattern. Moreover, SC and FC provide distinct sources of information for prediction of cognition.